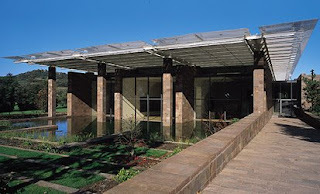 In a extremely sensitive response to the collection, its creators and the location, Renzo Piano has created an ideal building for presenting modern art. 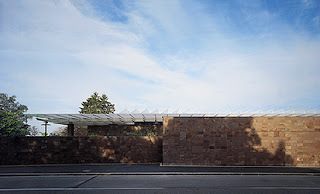 From outside, the approximately 127 metre-long building, which is shielded from traffic noise by a porphyry-clad external wall, resembles a ship lying anchored alongside the busy road. On passing through the entrance gate, one finds oneself in the calm of an English-style landscape park. To the right, nestled among groups of trees, one sees the pavilion-like museum built out of a harmonious combination of stone, white-painted steel and glass. Its projecting glass roof, with a surface area of approximately 4,500 square metres, seems to float above its four monumental parallel walls. 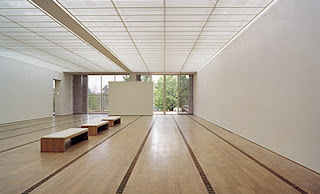 Piano has described his task in the following words: "A museum should attempt to interpret the quality of the collection and define its relationship with the outside world. This means taking an active, but not an aggressive role." 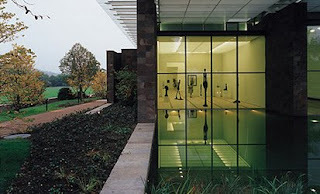 The use of glass for the museum's northern and southern façades creates interaction between the building and the park. Through the interconnections he has established between the interior and the exterior, Piano has created a unique synthesis of art, architecture and nature. In a previous post I wrote about my experience at the Mark Rothko exhibition, these are some pictures from the out and inside of the museum. It's truly a great building to wander in. 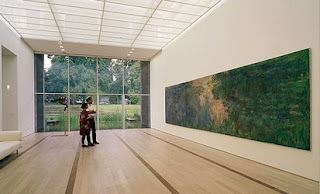 Don't you just love the enormous painting by Matisse?